This homepage is dedicated to all faceters who like to cut other designs than SRB:s.
I have been faceting since 1987 when I bought a Raytech Shaw faceting machine. It was my first cutting machine, I hadn't even cut any cabochons before that. I like to design new cuts. 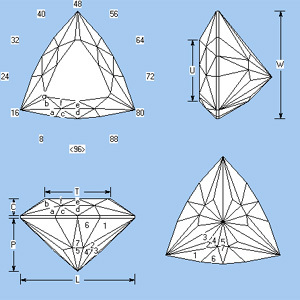 My second stone was a new design, se star cut below. 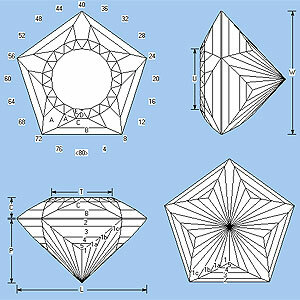 I live in Sweden and people who cuts faceted stones in our country are only a few. Feel free to use my designs as much as you like. Of course I'll be glad if you will make a note who the designer is if you use it commercially. Cutting instructions is included in the gemcad files or the pdf-files. 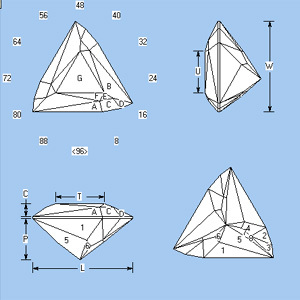 Gemcad is a very good program if you like to design your own gems, follow this link to read more. I hope you´ll like my designs. Cascade is the name of the design, because reflections are spreading from center and out like a water cascade. The cut is a variation of E Strouts design Menuette. The name comes from my sisters youngest daughter Josefina. The design does not have an ordinary girdle. All facets should be polished. 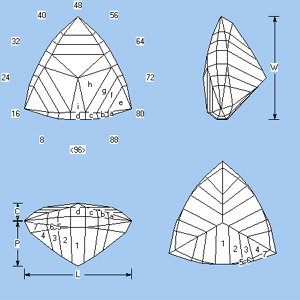 The first cut was a colorless zircon from Mud Tank Zircon Field, N.T., Australia. 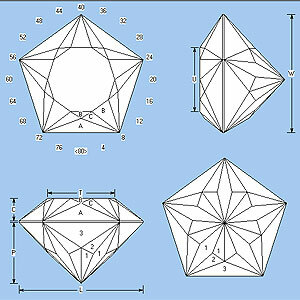 It is easy to overcut table facets because of small differences in angles. First cut was a very pale blue topaz from Australia - which gave a very nice brilliant gem. 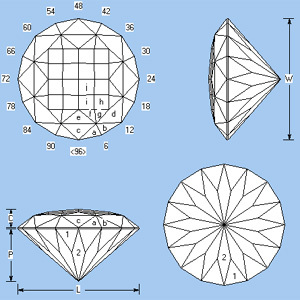 This design is for larger gems. 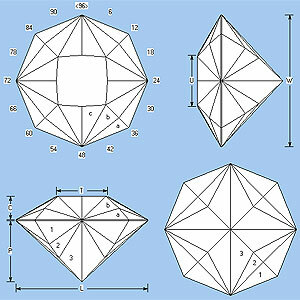 Especially notice that you shall cut 5 more A-facets which will be overcutten by D-facets. Gemcad does not handle this in its index tables. I have described it in the cutting instructions instead. This is an easy straightforward cut with only a few angle and index changes. It gives a nice brilliance and is best for small and medium sized gems. This design is very effectfully for colorless material like rock crystal, Topas. The design is also published at Bobs Rockshop where you have more information.